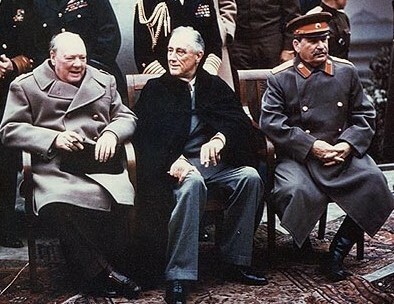 at the Yalta Conference in February 1945. Arthur Neville Chamberlain was born in Birmingham, England, on March 18, 1869. Neville Chamberlain was Prime Minister of Great Britain in September 1939 at the start of World War II. In May 1940, after the disastrous Norwegian campaign, Chamberlain resigned and Winston Churchill became prime minister. Why did Chamberlain resign as prime minister? Members of the House of Commons saw him as an uninspiring war leader. He was blamed for loss of Norway to the Germans. Chamberlin realised that a National Government of all political parties was mandatory. In May 1940 members of the Labour Party and Liberal Party refused to serve in his proposed National Government. Chamberlain resigned realisng that a National Government would not be possible as long as he was leader. He was replaced by Winston Churchill. Winston Churchill was born in Blenheim Palace, Woodstock, on 30th November, 1874. 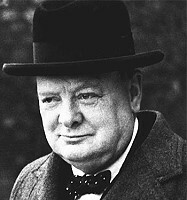 Prime Minister of Great Britain during most of the war, from 1940 to 1945, Churchill led Britain to victory. During the Battle of Britain, Churchill's speeches boosted the British morale during the darkest moments. Stalin was very brutal Communist dictator of Russia (1928-1953). In the years before World War 2 Stalin murdered or imprisoned almost all of Russia's senior military officers, and millions of other Russian citizens, in a paranoid and unprecedented wave of political terror. 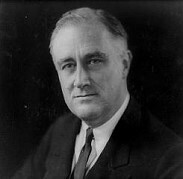 President of the United States of America (1933-1945). He declared war on Japan after the bombing at Pearl Harbor, but unfortunately he did not live long enough to celebrate the Allies' victory in September of 1945. Became president of the United States in the final year of World War II. He played a major role in the war's outcome by making the decision to use the atomic bomb against Japan. A French general who led the French in their fight against Germany. 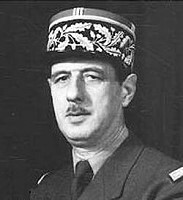 After World War II, he became president of France. Prime minister of Canada joined World War 2 beside Great Britain when the war started. Prime minister of Australia, joined World War 2 beside Great Britain when the war started. Prime minister of New Zealand joined World War 2 beside Great Britain when the war started. Adolf Hitler was born on April 20th 1889 in a small Austrian town called Braunau, near to the German border. Hitler served in the Bavarian army during World War I and rose to become the leader of Nazi Germany during World War II. Under his leadership, the Nazis sought to make Germany the most powerful empire in the world and exterminate all they viewed as inferior. In pursuit of this, he ordered the extermination of over 11 million people, the majority of them Jewish, but also including Roman Catholics, Roma (gypsies), Jehovah's Witnesses, homosexuals, the physically and mentally handicapped, and any others who did not meet Hitler's standards for "racial purity." This mass killing is known as the Holocaust. As the war was ending, and it became clear that the Germans would not win, Hitler retreated to a bunker with his mistress, Eva Braun. He arranged for the their marriage and then it is believed that Eva poisoned herself while Hitler killed himself with a pistol shot on April 30, 1945. Prime minister of Japan (October 1941 - July 1944). Prime minister of Italy (1922-1943). He joined forces with Adolf Hitler to fight the Allied powers. Eventually, he was sacked as prime minister and executed by his own people.